In early 2016, I was diagnosed with Hashimoto’s. For most of my life I struggled to maintain a healthy weight, despite living a very active lifestyle, and eating a clean diet. I suspected Thyroid disorder for years, but was told time and time again that labs were “normal”. My symptoms continued to get worse, peaking in 2015. Not getting any answers through conventional medicine, I turned to Functional Medicine. It was Functional Medicine that gave me the answers I needed to begin my healing journey. Throughout the healing process I has followed Detox, Elimination, AIP, and Keto food plans. It has been my experience that true healing encompasses mind, body, and soul. I developed a meditation, positive imagery, and belly breathing practice as a part of my healing process, and encourage all of my clients to utilize these tools as part of theirs. Through diet and lifestyle modification, I was able to get my Hashimoto’s into remission. I have been passionate about health, nutrition, and wellness for a long time. During the early stages of my Hashimoto’s diagnosis that passion motivated me to do lot of research. 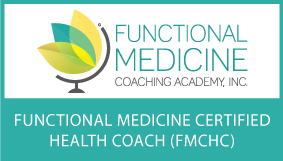 It was through this research that I discovered a Functional Medicine Health Coaching program being offered by FMCA. I saw this program as the perfect opportunity to apply my passion for health, wellness, healing, and helping others. One of the biggest challenges I faced as a newly diagnosed autoimmune patient was having a lot of questions, but no real support system. When I realized that Health Coaches help to fill that void, I knew it was my calling. I believe the key to success is working with each individual and allowing them to work at pace that is realistic for them. The major components I addresses are stress, emotional and mental health, exercise, dress, and silence and meditation. There are an abundance of stressors in our everyday lives, some obvious, some hidden. I work with my clients identify the stressors that are keeping them sick and develop a plan to help reduce stress and promote healing.